Given the drama and controversy that erupted at the Pakistani box office in 2014, this year turned out to be a boring affair. Jawani Phir Nahi Ani (JPNA) singlehandedly eliminated the weak competition and smoothly established its box office supremacy. Only three days into its release, JPNA has broken more than a handful box office records — most notably of the highest Eid collection (in Pakistan) after it surpassed Kick’s year-long record of Rs57.8 million by earning Rs74.5 million. Even prior to the film’s release, both the distributors and exhibitors had displayed confidence in the movie terming it as the ‘ideal’ Eid release. JPNA seems to have repaid all of their trust as it ended up exceeding the expectations of the film’s producers as well, who had predicted an opening weekend in the range of Rs40 million to Rs50 million. Having grossed Rs20.7 million on the first day, the distributors reworked their target setting on an even higher benchmark. “We changed the target business to Rs70 million, following the outstanding performance on the opening day,” the chief executive officer of ARY Films, Jerjees Seja, told The Express Tribune. Satish Anand, CEO of Eveready Pictures, had also touted the film to do well; something which he believed was partly due to the lack of competition. “I had expected the film to do well but I think that it has greatly benefited from the absence of major releases this Eid,” stated Anand. But Seja believes otherwise, telling how the number of shows was evenly distributed between the movies and noted that other releases, such as Halla Gulla, gained valuable footfall due to their release alongside JPNA. As it stands, the film has already managed to capture the audience’s attention and is a sure-shot favourite to surpass Dhoom 3 (Rs24m) and Waar’s (Rs23.4m) box office totals in Pakistan and become the highest grossing film in Pakistan. Waar, which had the luxury of a nine-day weekend earned Rs95 million, a record which was later broken by Dhoom 3’s Rs123 million opening week tally. JPNA is already breathing down Waar’s record and given how the distributors of the film expect the film to earn between Rs120 million to Rs140 million during the opening week, there is a strong chance that it may usurp Dhoom 3’s record as well. “It depends on the coming few days. 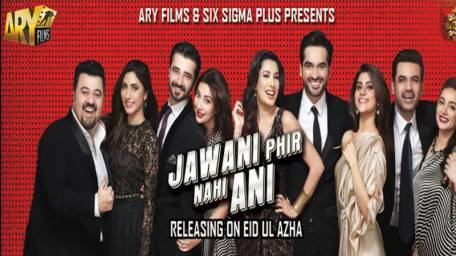 Unlike Eidul Fitr, JPNA does not have the luxury of a four-day weekend and even though the audiences in single screen cinemas may reduce a bit but I expect it to continue its strong performance in multiplexes,” remarked Seja. Where other distributors have termed the film’s success as a byproduct of excellent release timing, exhibitors have pointed out to the film’s comic content as a major selling point. Although glad at the success of the film, writer Vasay Chaudhry did not take all the credit for it and cited the example of Waar to explain how content does not guarantee a movie’s box-office fate. “Waar was also released on Eid and it was an action film in English but turned out to be a blockbuster,” said Chaudhry. He went on to praise Asim Raza, the director of the forthcoming Ho Mann Jahaan, for his decision to postpone his film to post-Muharram, a decision that allowed JPNA to complete its run in the three weeks leading up to Muharram. “By releasing multiple local films on Eid the profit is split. That happened with Bin Roye and Wrong No on Eid and then Moor, Shah and Dekh Magar Pyaar Say. We need to allow films to complete their full run.” JPNA has been released on 80 screens whereas Waar, Dhoom 3 and Kick were released on 48, 56 and 58 screens respectively.